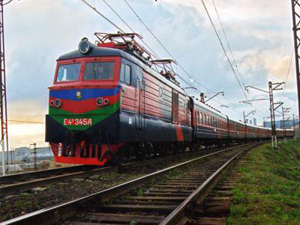 Azerbaijan Sate Railway was founded on January 20, 1880. The lenght of the first railway in Azerbaijan was equal to 20 km, and served for oil transportation with steam tractive between Baku and Sabunchu. 550 km long Baku-Tbilisi railway and 231 km long Derbend-Bileceri railway were constructed and put into operation on May 8, 1883 and in 1900 respectively. ASR was one of the most important steel highways in the former Soviet union, Azerbaijan railwaymen succesfully passed very difficult tests in the World War II, supplied the Red Army with fuel and oil products, sent to the front 1 300 000 and 600 000 tanks carriages full of fuel as well.Currently, the lenght of railways in Azerbaijan Republic is equal to 2944 km, operating lenght is 2122 km. More intensive parts of the railway, i.e 1277.1 km are electrified, and this part comprises 60% of the total length. ASR carried 26 201 000 tons of freight, 5 509 700 passengers, freight turnover was 9 524 million ton per km, passenger turnover was 881.1 million passenger per km in 2005. The amount of transit freight transportation on the Europe-Caucasus-Asia (TRACECA) corridor has been 7 327 600 tons.Azerbaijan State Railway includes Transportation Processes Management Union, Passenger Transportation Production Union, “Locomotive Production” Union, “Carriage Service” Production Union, Road Production Union, Power Supply Production Union, Indication and Communication Production Union, Militarised Enforcement Organization, Nakchivan Department and other enterprises.Currently, express and firm trains of remote purpose travel to Russia (Baku-Moscow, Baku- Saint-Petersburg, Baku-Rostow, Baku-Tumen, Baku- Mahachkala), Ukraine (Babu-Kiev, Baku-Xorkov), Georgia (Baku-Tbilisi), and trains of local purpose travel on Baku-Kocherli-Balaken, Baku-Astara-Horadiz, Baku-Kazakh- Boyuk Kesik, Baku-Agstafa, Baku-Gandja, Baku-Mingechevir, Baku-Astara routes.